There is always a clash between Google and Microsoft be it apps, APIs or operating system. When it comes to website analytics, Microsoft hasn’t got a solution and most websites rely on Google Analytics to keep a track on its usage. Google hasn’t released its official apps for Windows phone and likewise it doesn’t have an official SDK for analytics on windows phone but thanks to some excellent 3rd party SDKs its very simple to add it to your app. Here are four simple steps that would integrate Google analytics to your app. Step 1. Create a account and get your tracking id. If ever you have used google analytics for websites then this step would be quite simple. Just create a new account for your apps. Fill in the details and click on Get Tracking ID. On the next screen you will be able to see the tracking ID and options to download SDKs for android and iOS . For windows phone we will be using a 3rd party SDK.We don’t need to download them. Step 2. Install Google Analytics SDK for Windows Phone. 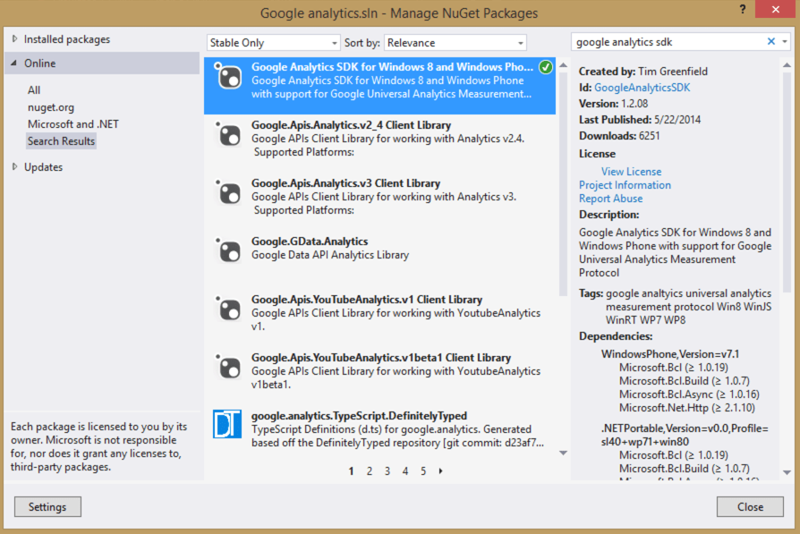 You can add Google analytics SDK for Windows 8 and Windows Phone using NuGet package manager. Here’s an article explaining how you could integrate a toolkit or third party SDK using with your Windows Phone app using Nuget Package Manager. After the installation complete you will see that a file called analytics.xml has been added to your project. Step 4. Now you can track Various events, Page views and Exceptions of your app. Heres the screen shot of the app with a click me button. The constructor for the page has the code to track page view and the click event handler has the code to track events. Also it can catch exceptions and report it. You can get the full source code of the project from the link given below.